With Harry (Rupert Evans) MIA on the Sunday, April 21 episode of CHARMED, the sisters get unexpected help. Charmed -- "The Replacement" -- Image Number: CMD118a_0026.jpg -- Pictured (L-R): Eva La Dare as Mama Roz, Madeleine Mantock as Macy and Melonie Diaz as Mel -- Photo: Colin Bentley/The CW -- ÃÂ© 2019 The CW Network, LLC. All rights reserved. On the Sunday, March 31 episode of CHARMED, Maggie (Sarah Jeffery) goes MIA while undercover. 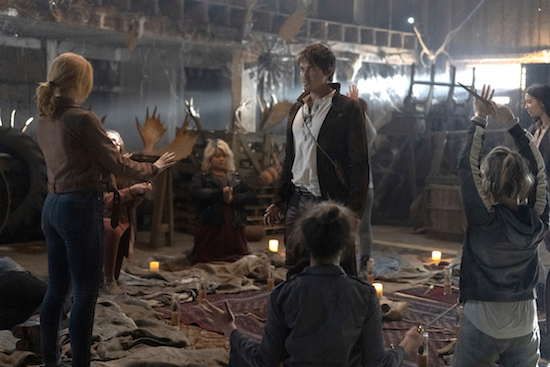 Charmed -- "Surrender" -- Image Number: CMD117b_0193.jpg -- Pictured (center): Tyler Blackburn as Viralis -- Photo: Colin Bentley/The CW -- ÃÂ© 2019 The CW Network, LLC. All rights reserved. 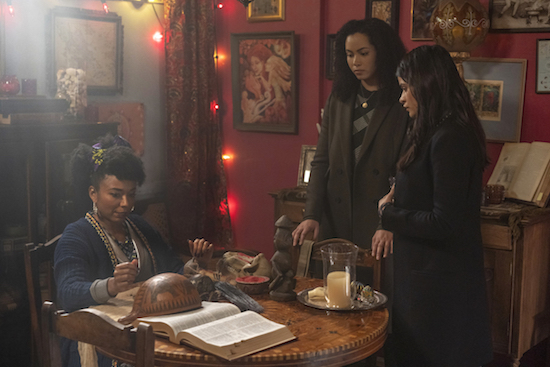 As CHARMED’s Macy (Madeleine Mantock) deals with her memory issues, she has to rely on others to get through it. 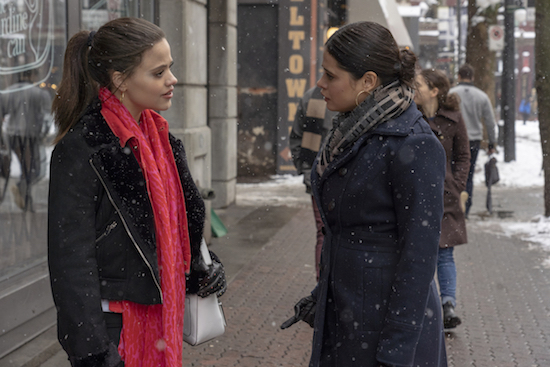 Charmed -- "Memento Mori" -- Image Number: CMD116a_0018.jpg -- Pictured (L-R): Sarah Jeffery as Maggie and Melonie Diaz as Mel -- Photo: Colin Bentley/The CW -- ÃÂ© 2019 The CW Network, LLC. All rights reserved. 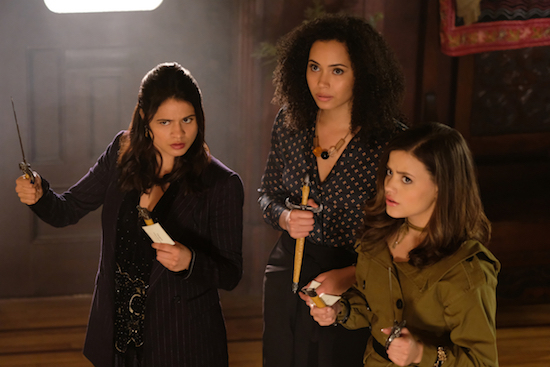 The CHARMED sisters get a little too close when Mel (Melonie Diaz) and Maggie (Sarah Jefferey) swap bodies—and powers—on the Sunday, March 17 episode of the show. 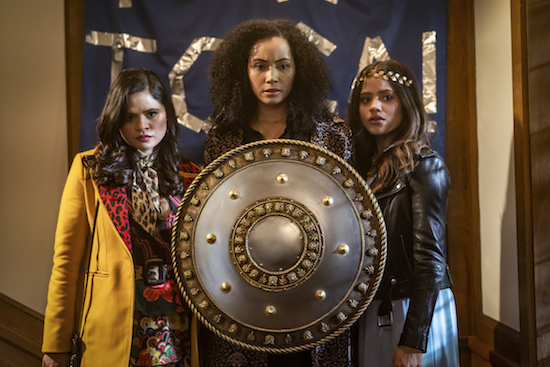 Charmed -- "Switches & Stones -- Image Number: CMD115b_0544.jpg -- Pictured (L-R): Melonie Diaz as Mel, Madeleine Mantock as Macy and Sarah Jeffery as Maggie -- Photo: Colin Bentley/The CW -- ÃÂ© 2019 The CW Network, LLC. All rights reserved. The CHARMED trio find things a little out of their control in the Sunday, March 3 hour of the series. 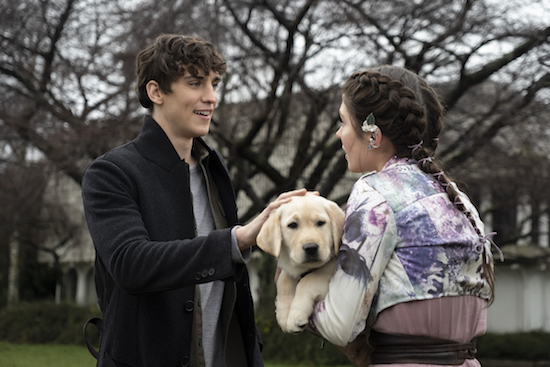 Charmed -- "Manic Pixie Nightmare" -- Image Number: CMD113a_0083.jpg -- Pictured (L-R): Nick Hargrove as Parker and Emily Bader as Chloe -- Katie Yu/The CW -- ÃÂ© 2019 The CW Network, LLC. All Rights reserved. 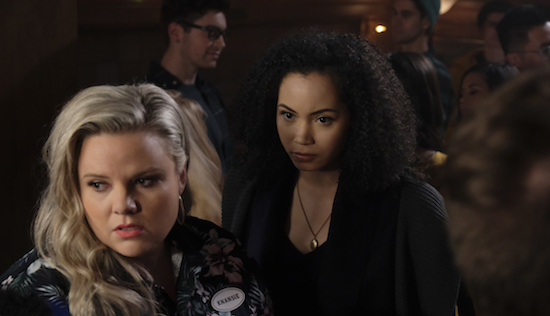 Macy (Madeleine Mantock) and Maggie (Sarah Jeffery) are in danger on the Sunday, February 17 episode of CHARMED, when Macy decides to take things into her own hands. Charmed -- "You're Dead To Me" -- Image Number: CMD112a_0033.jpg -- Pictured: Madeleine Mantock as Macy -- Michael Courtney/The CW -- ÃÂ© 2019 The CW Network, LLC. All Rights reserved. Charmed — “Bug A Boo” — Image Number: CMD108c_0178.jpg — Pictured (L-R): Madeleine Mantock as Macy, Melonie Diaz as Mel and Sarah Jeffery as Maggie — Photo: Diyah Pera/The CW — ÃÂ© 2018 The CW Network, LLC. All Rights Reserved. 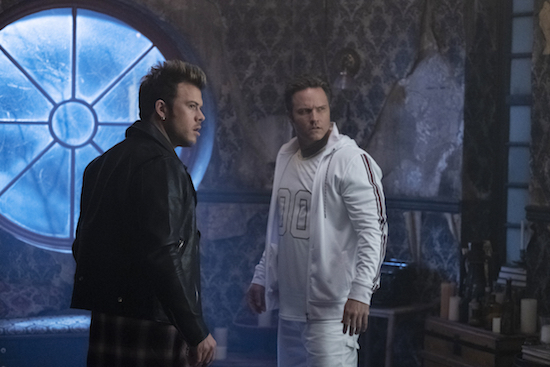 CHARMED has been one of the quiet successes of the season, nabbing a (now-rare) full 22-episode season and helping the network launch original programming on Sunday night. But one of the key elements of its success is something you can’t script: the chemistry among its stars—Madeleine Mantock, Melonie Diaz, and Sarah Jeffery—who portray the witch sisters. And going through an experience like CHARMED, which is a reboot of a popular series, can be a lot for its stars to go through…so the trio has also had each other to lean on. 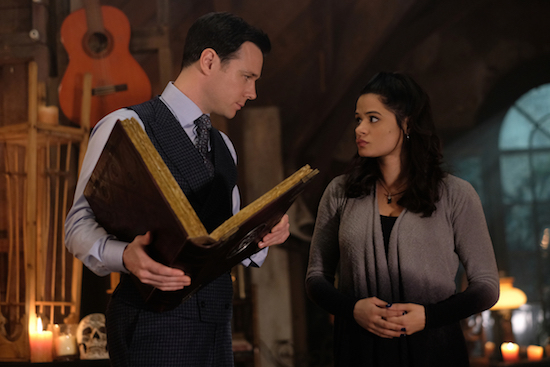 Charmed — “Other Women” — Image Number: CND105b_0077.jpg — Pictured (L-R): Rupert Evans as Harry and Melonie Diaz as Mel — Photo: Robert Falconer/The CW — ÃÂ© 2018 The CW Network, LLC. All Rights Reserved. 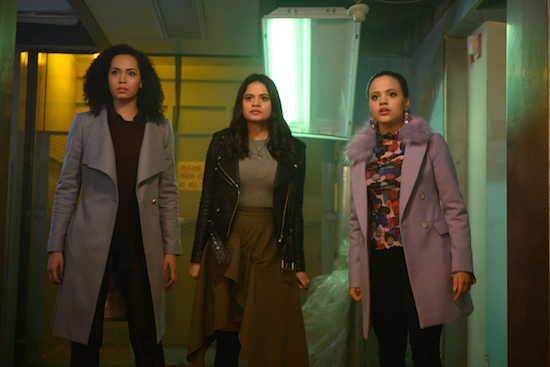 Charmed — “Exorcise Your Demons” — Image Number: CMD104a_0440.jpg — Pictured (L-R): Melonie Diaz as Mel, Madeleine Mantock as Macy and Sarah Jeffery as Maggie — Photo: Robert Falconer/The CW — ÃÂ© 2018 The CW Network, LLC. All Rights Reserved. With Thursday’s full season pickup, CHARMED became one of the few shows to receive a full 22 episode season. Though they only found out the episode count a few hours before the pickup was made public, “we were planning for that,” executive producer Jessica O’Toole told reporters after a screening of an upcoming episode.